When Jean Blaise first dreamed up the “Les Allumees,” festival in 1984, he thought it would be a six-year draw to the centre of his city, Nantes, France. Blaise had pitched the new mayor on turning the downtown into a giant art exhibition for only one night, bringing in international artists and drawing a crowd to a lit-up core. But Blaise lit a spark that would quickly spread across Europe... and to Canada. It was Paris, at first, that spread the event to North America. In 2001, after the city had begun its own evening of all-night art, brought to it by the success of Blaise‘s idea, the mayor’s office began inviting large cities to start their own Nuit Blanche events. Nuit Blanche has become a universal name for a sunset-to-sunrise event that features contemporary art in various forms throughout a city. Usually, museums and galleries will take part, flinging open their doors for the public to walk into their world. The host city is often turned into a de facto art gallery for one evening, providing a backdrop for everything from huge installations to performance art to engineered art. With Paris’ prodding, the “White Night” quickly hopped the pond. Now, cities like Toronto, Winnipeg and Montreal all host their own versions. Internationally, all-night free public art events also take place in Melbourne, Australia, Rome and Madrid, amongst others. In 1997, the Long Night of the Museums took place in Berlin, and has since grown from 12 to over 100 exhibition and tens of thousands of onlookers. “In Toronto, it’s the last fling in public, before we hunker down for a long-running Canadian winter,” says Julian Sleath, programming manager at the city’s Scotiabank Nuit Blanche, which is heading into its ninth year. At the root of Nuit Blanche is a feeling of permission – to walk the streets very late at night, to talk to strangers, to gawk at the weird and wonderful. “There are very few events that give an invitation to journey through the city and do stuff in the very early hours,” says Sleath, especially in a city nicknamed “Toronto the Good,” where not long ago most establishments closed by 11 p.m. This year's Nuit Blanche event in Toronto, German art group “A Wall is a Screen” hosted, in partnership with the Goethe-Institut, an event that was part guided city tour, part art project and part film night. The group guided people through downtown Toronto, stopping to watch videos projected onto walls and surfaces. While the group has been guiding these tours since the Hamburg International Short Film Festival in 2003, this year’s installation was curated to focus on the theme of tearing down walls. So they have organized their Nuit Blanche, held in mid-September, just outside City Hall and the nearby Olympic Plaza, a place most often associated with an at-risk population, which Baerwaldt describes as “desperate people in a land of plenty.” Calgary provides an interesting backdrop for an event like Nuit Blanche – a large part of the city’s population is young and from other countries, so public art can act as a touchpoint to bring them all together. A similar project has taken off in another oil and gas town – Houston. This year, Calgary’s Nuit Blanche welcomed an audience of 16,000 people. That’s small compared to Toronto, which last year estimated that a million people took part in the event, which included pieces from internationally renowned names like Ai Weiwei. In Montreal, February’s Montréal en lumière festival includes everything from wine tastings to a toboggan course in the dead of their notorious winters. But there is a strong network of smaller events in cities like Calgary and Halifax that focus on an independent art scene rather than a huge event. 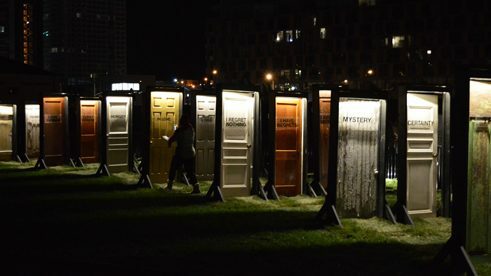 Heading into its seventh edition in Halifax, Lorraine Plourde, the chair of the board of Halifax’s Nocturne event, says artwork on the streets are night “creates a lot of magic.” The programme there pushes to unite both side of the Halifax Regional Municipality, a city that is divided by the Halifax Harbour. They have done this by programming events on the ferry between both Halifax and Dartmouth sides of the city: “Part of the goal is to break down barriers in accessibility to visual art,” she says. Lyndsie Bourgon is a writer and editor currently based in Calgary, whose work appears in publications including The Walrus, Maisonneuve and Roads & Kingdoms.